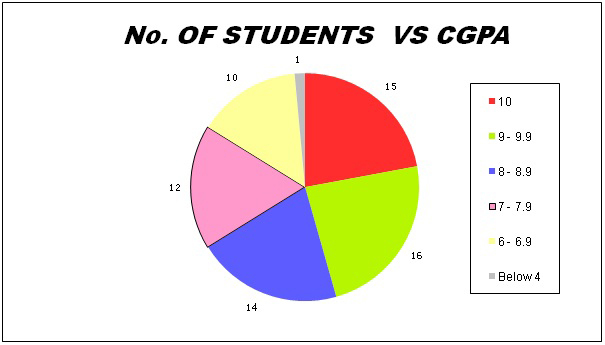 We do not rank our students for we strongly believe that it leads to an unnecessary competition for point percentages. 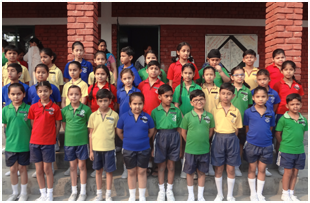 However excellence in academics is duly recognized and Scholar badges are awarded to meritorious students scoring the highest percentage of marks in all the classes. 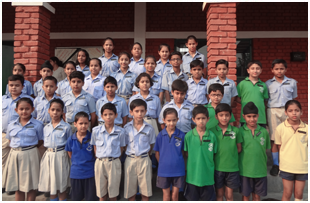 Scholarships are awarded to deserving students from humble backgrounds, who show significant academic progress. Scholarships are given to meritorious wards of widows, war widows etc. 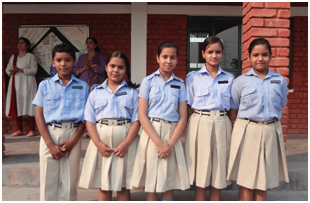 and to children who show consistent academic progress and come from economically weaker sections. To avail the scholarship for the next one year, application should be made well in advance. 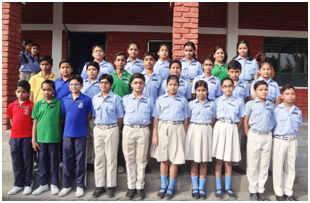 For the second time in a row Vision Valley School retained the title by winning the Battle of Brains Quiz Competition hosted by Kalpvriksha, a wing of the Kashipur chapter of Indian Medical Association(IMA). 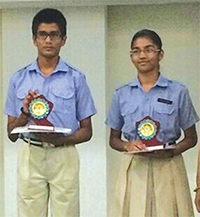 Hrishikesh Bhattacharjee of Class IX and Shreya Kapila of Class X qualified to represent the school in the senior category and went on to win the contest by securing first position. They were rewarded with trophies and cash prizes. Ketav Rastogi and Vishnupriya Bansal of Class VI, Pavni Tandon of Class IX and Raunak Mehrotra of Class X received motivational prizes. For the first time ever in the history of Kashipur Gyanarthi Media presented the Redicals’15 Festival on 25th April. It was a grand event also comprising of ccompetitions like Debate, Face Art and Group Dance for the schools in and around Kashipur. Various schools from the region participated in the different events organized. From Vision Valley School Anshul Kansal and Lakshya Saxena participated in the Debate competition and Surabhi Kotnala and Isha Joshi in the Face Art. In both the categories Vision Valley stood 1st and grabbed the trophy for over-all excellence. 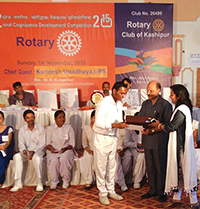 On 1st November, 2015 The Rotary Club, Kashipur hosted the 6th Zonal Cognizance Development Speech Contest. This competition was judged by a panel of seven Judges and Kamlesh Upadhyay, IPS was the guest of honour. The speakers from different schools spoke on topics like IT and Communication, Science and Technology, Politics etc. Lakshya Saxena of Vision Valley School, Kashipur left the audience awestruck with his eloquent speech on IT and Communication. The auditorium reverberated with applause and evidently Lakshya Saxena stood 1st in the Hindi Category and won the hearts of one and all. Building Author Sonal Kansal of class XII Commerce is all set to come out with her maiden work, a fiction novel which has been approved for publishing by Notion Press, Chennai. 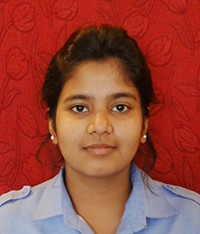 Ishika Saxena of Class VIII, ho can very well be called the nightingale of Vision Valley, owing to her melodious voice has achieved yet another feat by making it to the 3rd round of Zee- Sa Re Ga Ma Pa. She was auditioned in Delhi by a team comprising of musicians Sajid, Wajid and singer Shreya Ghoshal. 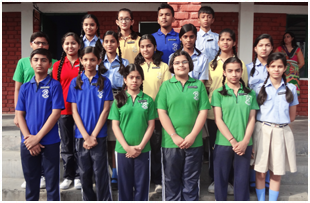 A Quicky Sudoku Competition was organized by Bhartiyam International School, Rudrapur wherein 9 students from Vision Valley School qualified for the final round, Over 30 schools from all over the region participated in the final held at Rudrapur. It was indeed a proud moment when three of our particapants Ravi Shankar and Ananya Madaan from Class VIII and Cherry Talyan from Class X secured positions among the top ten winners.